Sure, Bryce Reagan starting at second and Turner Gauntt making his first career appearance behind the plate were notable, but David Pierce coaching third base, something he has not done at Texas save for in response to an assistant’s ejection, was the most jarring part of the Longhorns win. Pierce didn’t welcome a visitor to third base until the third inning when Texas put up a four-spot. Austin Todd grounded out resulting in Gauntt crossing the plate. 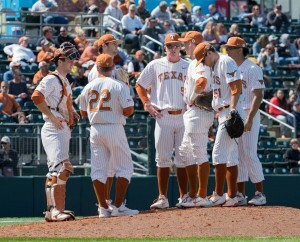 Three batters later, Tate Shaw knocked a bases clearing double to widen a Texas lead that would not be threatened. 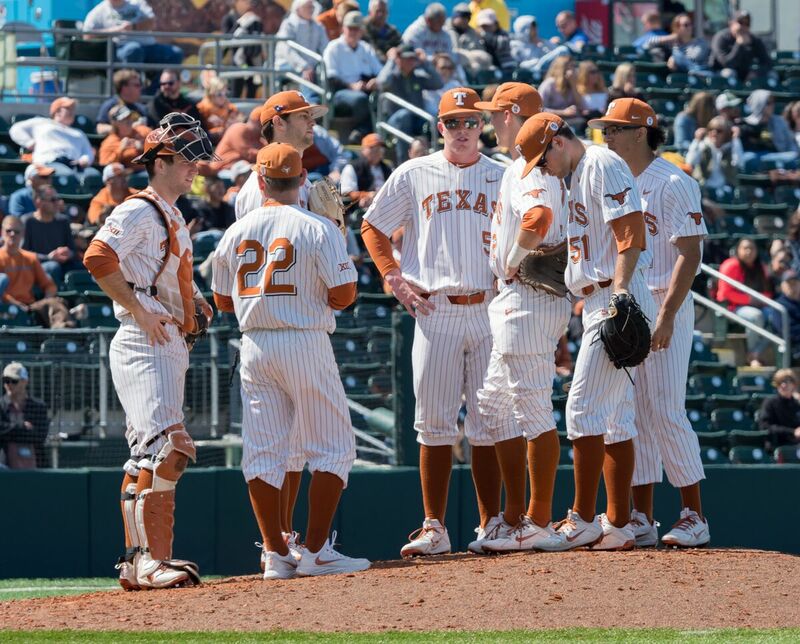 Though the offense wasn’t particularly overpowering save Michael McCann’s solo home run in the eighth to put the score at its final mark, it was an improvement over the goose egg the Longhorns posted Sunday. In addition, Matteo Bocchi led a five-pitcher effort with 5.0 innings of shutout baseball. Pierce explained his move to the third base coach’s box wasn’t a demotion of any kind for normal resident Sean Allen. Instead, it was a move Pierce believes could benefit both he and Allen as their team tries to steer out of a .500 stretch over its last eight games. Pierce jokingly explained this would be the norm so long as he could handle the jog from the dugout to the coach’s box. “It’s a lot of running over there,” he said with a laugh. The move is the first noticeable change that Pierce explained could occur after Sunday’s loss against Kansas State. One of his decisions and its explanation suggested another major change. Coy Cobb, who has been the No. 3 starter all season, appeared in relief against the Cardinals and worked a scoreless inning. Pierce was pleased with the performance and said Cobb could stay in that relief role going forward. He also said he was considering placing Ty Madden into Cobb’s No. 3 spot. 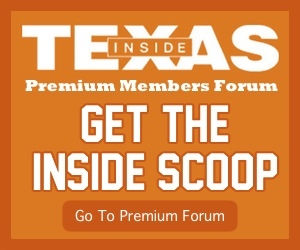 Those are just a few of what could be several changes for the 2019 Longhorns. Ever since navigating a tough March schedule and taking two of three from Texas Tech, the Longhorns have not won another conference series. In Pierce’s words, “we’ve got to fill in some blanks right now.” Starting Reagan and Gauntt, moving Cobb to the bullpen, and coaching third base are a few of the ways Pierce is trying to fill in those blanks. With the end of the regular season on the horizon, the faster those blanks are filled, the better.